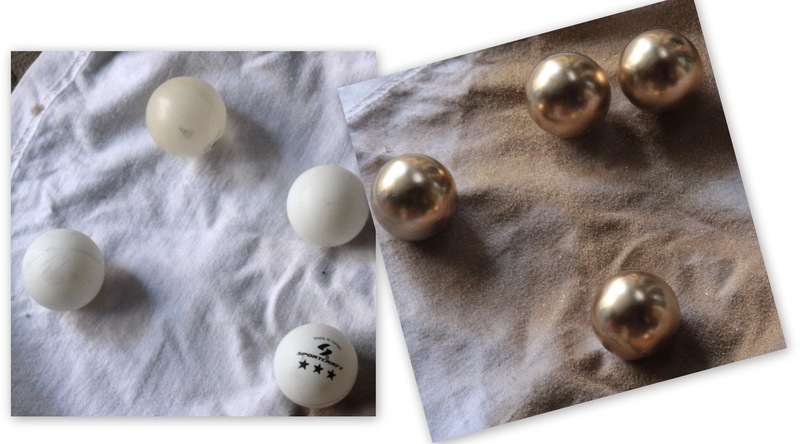 Yesterday I shared with you my DIY ping pong ball-finial curtain rods (try saying that three times fast). 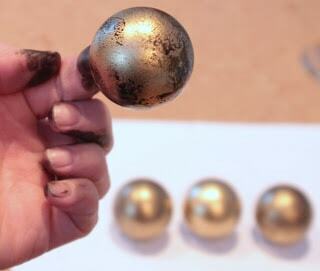 Today I’ll show you how to create that antique brass finish using paint. This technique works great on wood and plastic. For metal you can probably guess my trick – I’ll share that at the end. 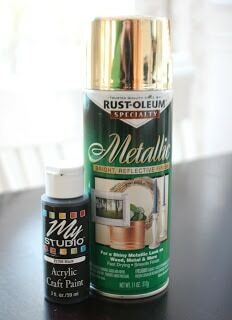 Spray your item with the gold spray paint (in a well ventilated area, wearing your safety mask) and allow to dry. 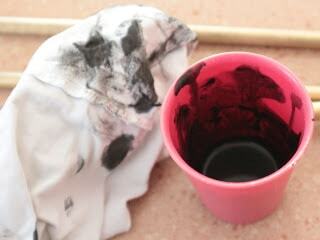 In a cup, thin out acrylic paint with water to create a glaze. 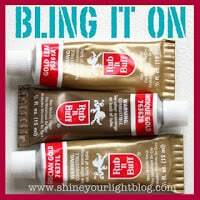 Rub the finish with your rag to remove or add more until you get the desired affect. It’s a wax-on/wax-off kind of thing. See the difference with the black paint? It tones down the gold a bit. I found that letting the glaze set for a few moments, then buffing a bit, softens the lines from the rag and gives a nice finished affect. 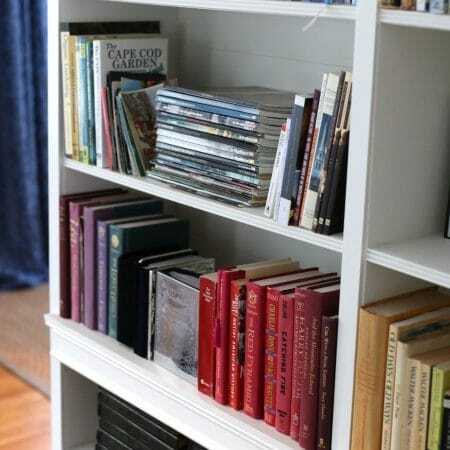 With wood, the black paint gets into all the nooks and crannies. The wax-on/wax-off method is all you need to bring those babies from shiny brass (bottom) to antique brass. The final product is a bit of understated bling. 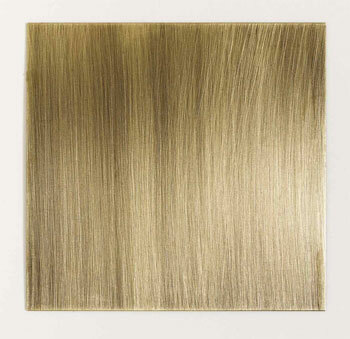 Now antiquing gold on metal. Spray paint adheres fine to metal, but the thinned-out black paint doesn’t spread properly; instead it just sits in little spots on the surface. You could try using un-thinned black paint in the wax-on/wax off method….or you could use one of my fave products to achieve an antique brass look. What I’m about to show you is a black base with gold over it. You could also buy Ebony Rub ‘n Buff, and rub it onto a gold item. In my bedroom I have three windows. 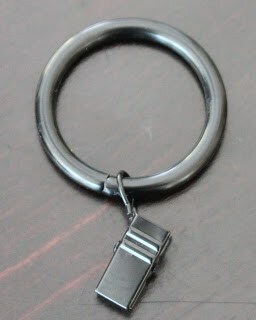 I had enough antique brass clip rings for two windows, and a million black rings like this one for the third window. I wasn’t about to go out and buy new clip rings when I seriously have probably 50 that I could use, with a little color change. 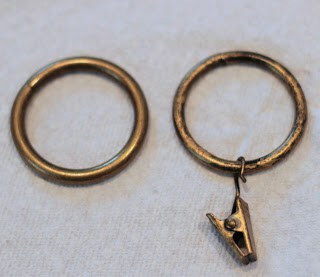 Below, this ring on the left is factory-finished in antique brass. Too much coverage with the Gold Leaf R&B on the black ring made it scream GOLD!! 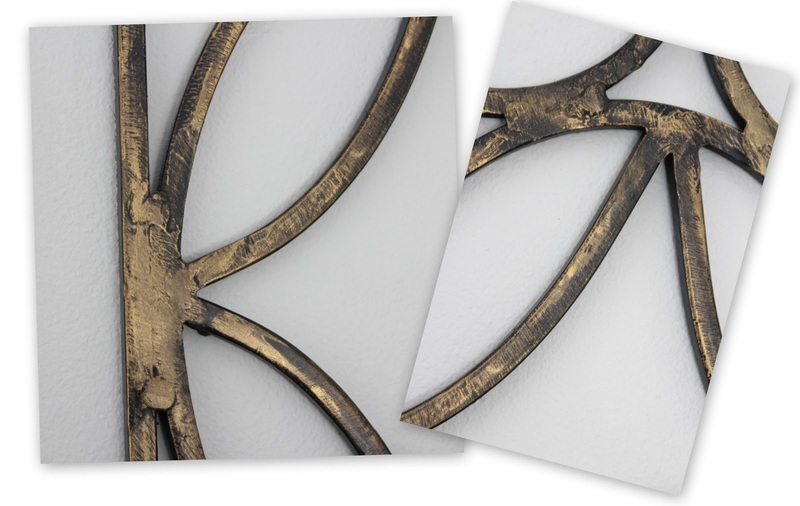 !, so I toned it down to the desired antique brass look by allowing a bit of the black to peek through. I let the R&B dry a bit, then buffed off a little. Moral: too much R&B and you don’t get that antique look. The window on the left has the factory-finished antique brass rings, and the one on the right has my R&B-over-black rings. In this photo they are hard to see, but you can’t even tell the difference when you’re in the room. I gave these black PB sconces in my dining room a touch of antique brassiness with a little R&B, too. 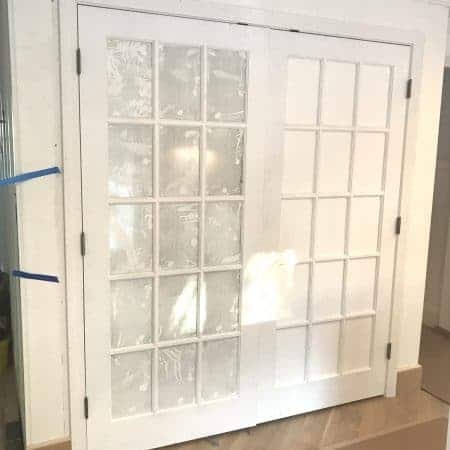 Sometimes playing around a bit with paint and/or R&B gives a piece more dimension than just spray painting, and can give new life to something in your home you’ve grown tired of. 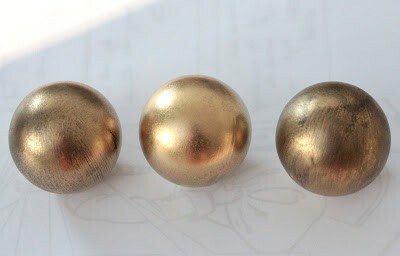 One more note about brassy doorknobs and cabinet hardware: I have found that R&B is NOT a great choice for toning down doorknobs and cabinet pulls/knobs that are going to be touched on a regular basis. 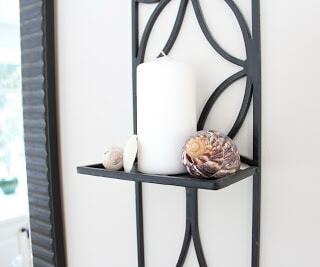 It is GREAT for hardware on a piece of furniture, or door hinges, but on knobs that you will touch frequently, the wax will wear off over time. 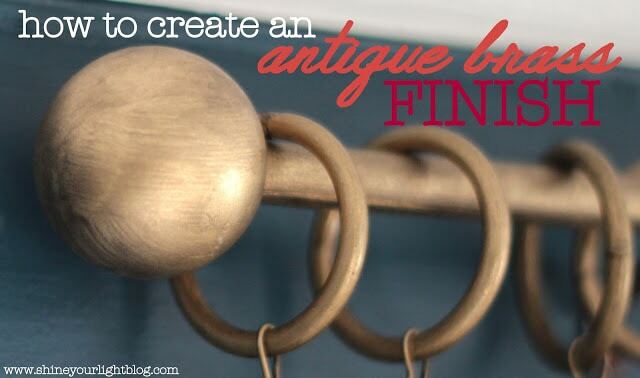 If you have brass doorknobs that you hate, I would recommend replacing the knobs and using R&B on your hinges like I did. 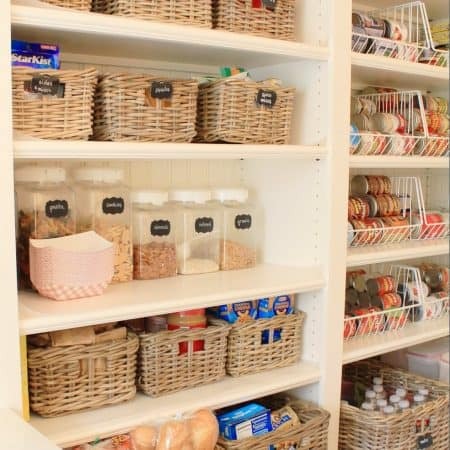 The hinges have held up perfectly and the knobs are NOT that hard for you to change out yourself! 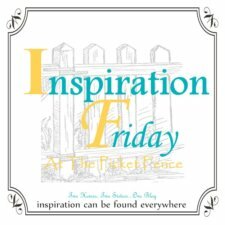 Seriously – read my tutorial – if I can do it, you can do it. Happy brass antiquing and happy day ahead, my friends! Linking up this week to these wonderful blogs! Wow, what a difference that made! 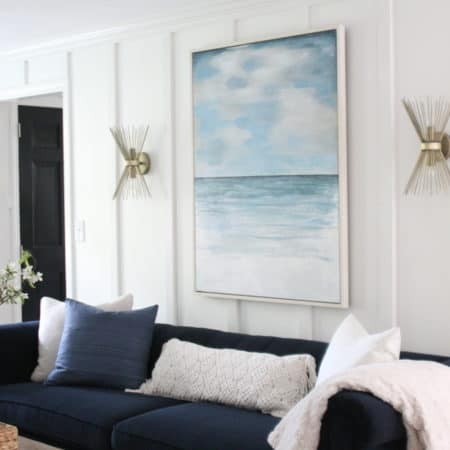 Love the sconces in your living room, too. I wouldn't have thought of gold over the black paint, but that looks amazing! Great tips, girl! those are the prettiest ping pong balls ever!!! I agree with anonymous-ha! What's that about? Anyway, great tutorial and pictures. 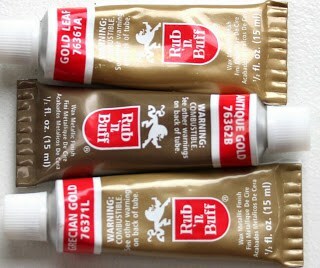 I just bought my first tube of rub & buff recently but haven't used it yet. So that should tone down the mirrors I sprayed gold right? I'll give it a whirl. Oh my, so pretty!!! Love me some rub and buff, hope your having a great week Lisa!! What a PERFECT finish. Like, PERFECT. I am crazy about it! I am so glad you posted this. I have a long wall of windows in my family room. I was brainstorming on a way not to break the bank. Thank you!! I'm catching up and cracking up as I read this…wish I would have read it about a month ago! I had the same problem trying to "age" some gold. Posting about mine this week! 😉 Your rods and clips look GREAT, and good tips on the R&B! Oh I love this. I have already purchased two metal, electrical conduits to do my double window (wide) and also decided to use the same on my other single window. I was very sad, cause I did NOT want to use styrofoam for my finials or tennis balls (too fuzzy and did NOT want to cover with fabric either. Thank you EVER so much for the ping pong ball idea. 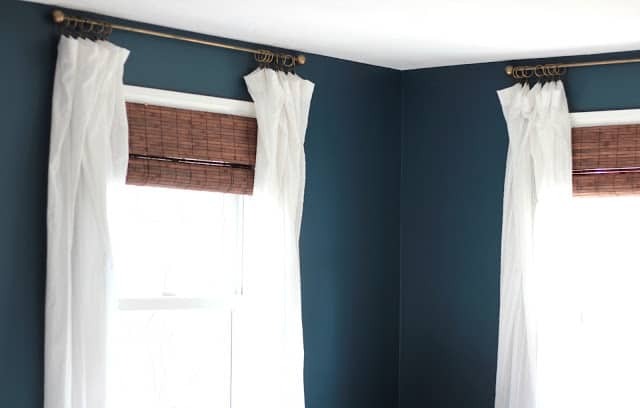 I think I am just going to paint my rod and finials white… walls will be light blue and curtain panels will be white, along with my sort of cafe style shades? lol…. long story on that part. 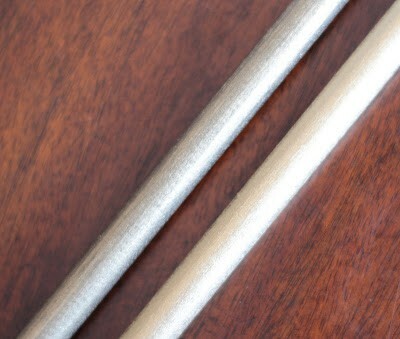 If I have metal items that are not already brass or black, which should I start with? 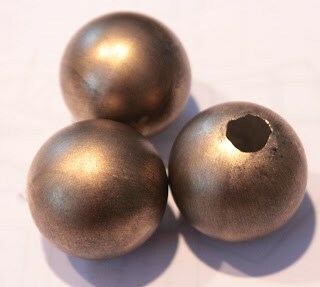 Paint them black and us gold rub and buff, or paint them gold and use black rub and buff? Or something else? I have a long wall of windows in my family room. I was brainstorming on a way not to break the bank. Thank you! !